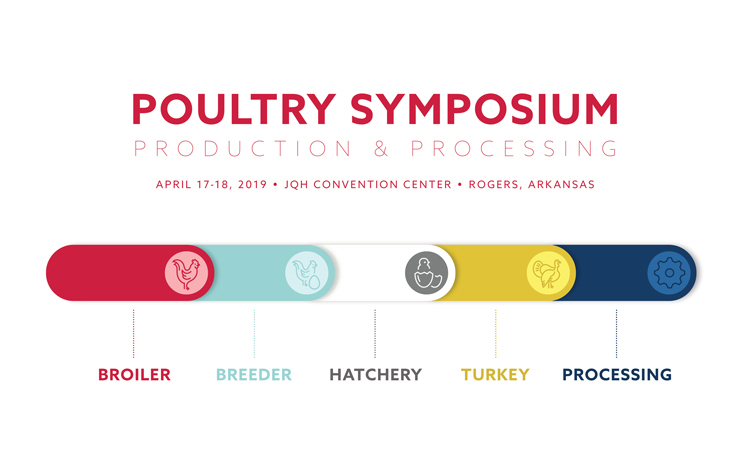 The 2019 Poultry Symposium for Production & Processing is scheduled to take place on April 17-18, 2019. The conference will be held at the John Q Hammons Convention Center in Rogers, AR. In 2018 the Federation combined the Live Production Symposium and Processors Workshop to create the Poultry Symposium for Production and Processing. In 2018, more than 80 vendor companies exhibited in the tabletop trade show, and over 700 people attended the event. Live production and processing personnel as well as suppliers who support live production and processing of turkeys, breeders and broilers are encouraged to register and attend the 2019 Symposium. The Poultry Symposium vendor tradeshow runs for two days and is a prime outlet for allied industry members to showcase their products and/or services to attendees. Attendees of the Symposium will include top level decision makers in live production and processing. Below is a brief outline for the two day Symposium. A detailed agenda will be available as we get closer to the event. Please note: If you would like to be a vendor you must register through the vendor registration found under the “Vendor Booth” section below. For more information on the 2019 Poultry Science Scholarship Golf Tournament and to register your team click on the “REGISTER” link below. If you are looking for a way to gain exposure to conference attendees as well as members of the Federation, sponsorship of the Poultry Symposium conference is a great way to show support and gain exposure. We have revamped our sponsorship opportunities to offer a variety of options, pick from standard sponsorship levels or a la carte options to build a sponsorship that fits your goals and your budget.